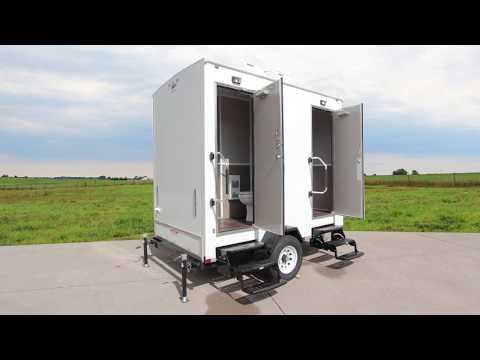 2 Station Sanibel Beach Series | Portable Restrooms Trailer | Portable Restroom Trailers, LLC. The well equipped 2 Portable Restrooms Trailer | Sanibel Beach Series offers all the amenities of home in any mobile environment. This unit features 2 standard unisex restroom suites. The well-appointed interior offers easy-to-clean, earth-toned fiberglass walls, vinyl tile floors, and white framed mirrors. The unit is completely self-contained with a 300 gallon onboard waste tank and a 100-gallon onboard fresh water tank. Your guests will enjoy the climate controlled interior with a roof mounted low profile air conditioner and upgraded 3 Season heat package. The 3 Season Heat Package is rated to handle cold temperatures as low as 30°F, including wall heaters in each restroom suite, and in the machanic’s room. This trailer is also upgraded to include a water heater so your guests can enjoy a hot water hand wash.
Portable Restrooms Trailers offer a mobile restroom solution without the permitting and build time of brick and mortar headache.